Shifting from the microscopic to the macroscopic, Crystal Constructs builds a model of the world, paralleling chemicals crystallising under pressure with the geometries of human constructs. Crystal Constructs is the second in a series of three film screenings in conjunction with the ‘Robert Smithson: Time Crystals’ exhibition. This is the colour version, made using the Dufay colour process. François de Roubaix’s electronic music accompanies these images of liquids crystallising, photographed under a polarising microscope. Colours give way to sepia, then refract to multiple colours. Crystals look like tiny organisms; small four-part fans share the frame with flowing lines of pink. Crystal World is inspired by JG Ballard’s apocalyptic science fiction novel where a viral crystal transforms trees, animals, humans and architecture into frozen prismatic jewels as time begins to leak and humans experience individual moments endlessly looped, repeated and prolonged. Borg’s work adapts this concept of crystallisation and applies it to Charles Laughton’s The Night of the Hunter (1955). Fragments of this iconic film were reconstructed in miniature and placed under water and a solution of mono ammonium phosphate, leading to the inexorable crystallisation of the film. 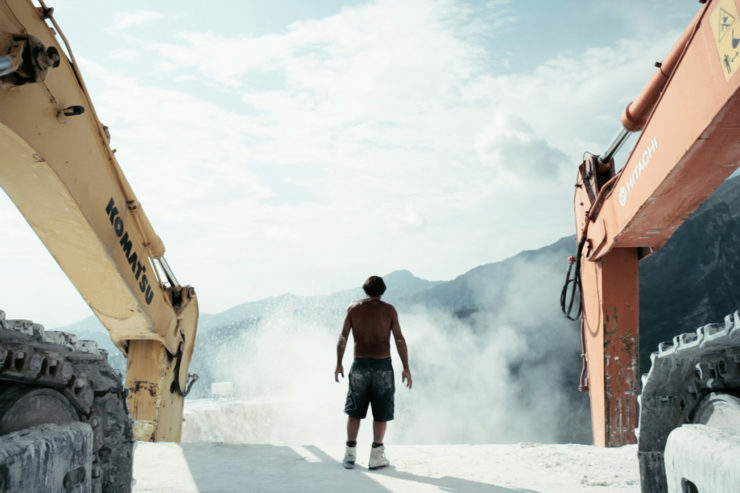 Monte Bettogli, Carrara: in the marble quarries, men and machines dig the mountain. Excavated for Delhi’s Akshardham, Rome’s Pantheon, Abu Dhabi’s Sheikh Zayed Grand Mosque, and Michelangelo’s David, and famous for its calming, luminous whiteness, Carrara marble belies the physically dangerous and exhausting work of the quarrymen exhuming it. Il Capo manages, coordinates and guides quarrymen and heavy-duty machines using a language consisting solely of gestures and signs. Conducting his dangerous and sublime orchestra against the backdrop of the sheer slopes and peaks of the Apuane Alps, the Chief works in total noise, creating a paradoxical silence. Fort Morgan is inspired by a brick fort of the same name on the Alabama coast. The film uses live-action footage and drawn animation to examine the geometric plan, physical materials, and structure of the 200-year-old fort. Following an intricate geometric diagram, the fort grows of its own accord like an oyster shell or a crystal forming, until it is eccentrically shaped, encrusted, and overgrown.